WELCOME TO THIS LOVELY, "ONE OWNER" HOME! 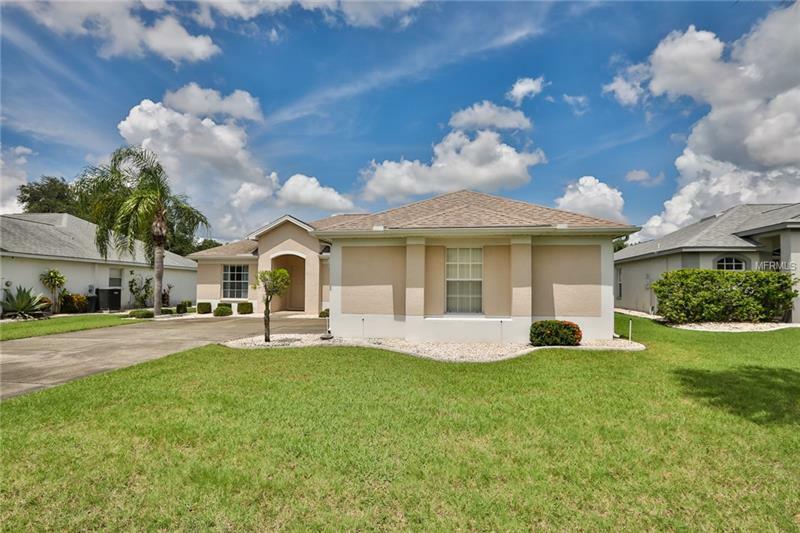 WELL MAINTAINED, 1579 SQ.FT HOME FEATURES, 2 BEDROOM/2 BATHROOMS/DEN/2 CAR GARAGE, WITH A SPLIT BEDROOM FLOOR PLAN, AND A COVERED 7 X 13 SCREENED IN LANAI. THE KITCHEN HAS ABUNDANCE OF CABINET/COUNTER SPACE, EAT-IN NOOK AREA WITH BAY WINDOWS, AND SLIDING GLASS DOORS LEADING TO THE LANAI TO ENJOY YOUR MORNING COFFEE. "NEWER REFRIGERATOR AND BARELY USED APPLIANCES". THE DINING ROOM IS SEPARATE WITH A NICE VIEW OF THE POND IN THE DISTANCE, VOLUME CEILINGS, SPACIOUS LIVING ROOM COMBO, AND AN OPEN FEELING, WITH SLIDING GLASS DOORS LEADING TO THE LANAI IN YOUR BACKYARD. THE MASTER BEDROOM HAS A LARGE WALK-IN CLOSET, BATHROOM WITH DUAL VANITY SINKS, GARDEN TUB, AND A HUGE WALK-IN SHOWER. YOU WILL LOVE TO HAVE FAMILY AND GUESTS OVER, WITH THE SPLIT BEDROOM PLAN, THEIR OWN FULL BATHROOM AND BEDROOM. THE DEN IS LIGHT AND BRIGHT AND CAN ALSO BE USED AS A 3RD BEDROOM IF NEEDED. HOME HAS A NEWER AIR CONDITIONER "2017", AND ALSO WILL COME WITH FURNITURE IF YOU NEED IT. COME START LIVING THE FLORIDA LIFESTYLE WITH ALL THE AMENITIES, FITNESS CENTER, CLUBS. ACTIVITIES, INDOOR AND OUTDOOR POOLS, TENNIS, GOLF, PICKLE BALL AND BEST OF ALL DRIVE AROUND IN YOUR GOLF CART. LOCATION IS GREAT WITH BEING CLOSE TO INTERSTATE TO TRAVEL TO ST.PETE, ORLANDO, TAMPA AND CLEARWATER TO VISIT OUR BEACHES. MAKE AN APPOINTMENT TO COME SEE THIS WONDERFUL HOME TODAY. Amenities Additional Fees: golf and other special classes are at an additional cost..